A moontain is a lairge laundform that stretches abuin the surroondin land in a leemitit aurie, uisually in the furm o a peak. A moontain is generally steeper than a hill. Moontains are formed throu tectonic forces or volcanism. Thir forces can locally raise the surface o the yird bi ower 10,000 feet (3,000 m). Moontains erode slowly throu the action o rivers, wather condeetions, an glaciers. A few moontains are isolated summits, but maist occur in huge muntain ranges. Heich elevations on moontains produce caulder climates than at sea level. Thir caulder climates strangly affect the ecoseestem o moontains: different elevations hae different plants an ainimals. Acause o the less hospitable terrain an climate, moontains tend tae be uised less for agricultur an mair for resoorce extraction an recreation, sic as moontain climbin. 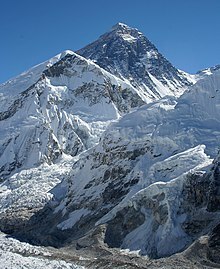 The heichest moontain on Yird is Moont Everest in the Himalayas o Asie, whose summit is 8,849.868 m (29,035 ft) abuin mean sea level. The heichest kent moontain on ony planet in the Solar Seestem is Olympus Mons on Mars at 21,171 m (69,459 ft).